Beaks that search for seafood soup ! Home > > Beaks Beaks that search for seafood soup ! 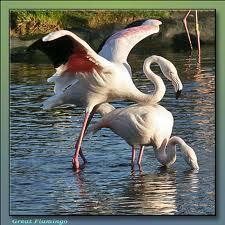 Flamingos live in salty marshes. Their beaks look bent and are lined with little ridges. These birds wade through shallow pools with their heads under water in search of food. They also use their beaks as filters to strain small creatures of the water.